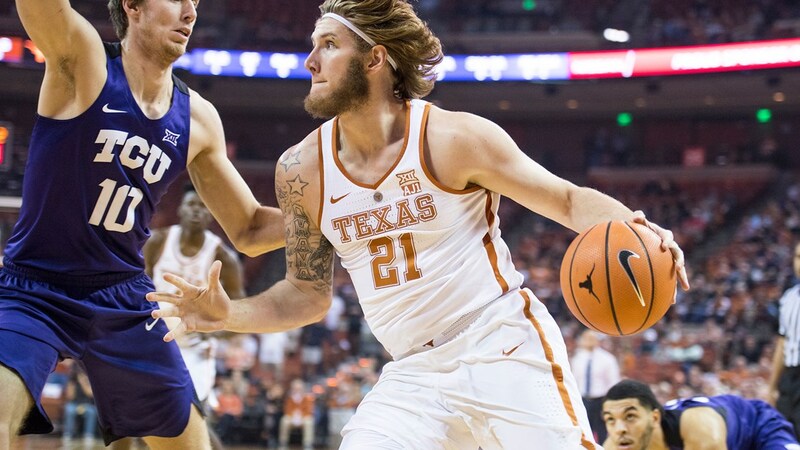 Forward Dylan Osetkowski and the Texas men's basketball team will meet TCU for the third time this season in the NIT semifinal Tuesday after rolling Colorado, 68-55 (photo courtesy of texassports.com). AUSTIN, Texas — The University of Texas men’s basketball team beat Colorado, 68-55, in the third round of the National Invitational Tournament (NIT) at the Frank Erwin Center, to earn a trip to New York City, where the Longhorns will face TCU in the semifinals. The trip to New York’s Madison Square Garden represents two opportunities for the Longhorns: they can keep playing for a postseason championship, and they can exact a measure of revenge against Big 12 rival TCU, which has beaten UT twice this season, including a 69-56 loss in Austin that spoiled the Longhorns’ Senior Day. The Longhorns and Horned Frogs’ third meeting of the season will be at 8:30 (Central time) Tuesday, April 2 in a game that will be broadcast on ESPN. TCU heads to New York with a season record of 23-15 after knocking off Creighton, 71-58, in the NIT quarterfinal. By winning a game that was not as close as the score might suggest, the Longhorns improved their season record to 19-16, while the Buffaloes’ season ended with a record of 23-13. Forward Dylan Osetkowski led the Texas offense with 15 points, and guard Kerwin Roach added 14. Guards Courtney Ramey and Matt Coleman added 11 points apiece. Freshman forward Jericho Sims, who is playing a bigger role since the knee injury suffered by freshman center Jaxson Hayes, hit just one of his four shots from the floor and was held to just three points, but he contributed heavily in other ways, most notably on the glass; his team-leading 10 rebounds allowed the Longhorns to edge the Buffaloes, 37-36, in total rebounds. Not coincidentally, UT held a 9-5 edge in second-chance points, and an 8-2 advantage in fast-break points. Colorado was led by guard Tyler Bey, whose double-double included a game-high 18 points and 13 rebounds. Against CU, Osetkowski was his usual efficient self, going 7-for-11 from the floor and pulling down five rebounds, while adding four steals and three assists without committing a single turnover. Texas broke the game open in the middle of the first half. Leading by a single point, at 14-13, with 10:31 to go before the intermission, a layup by Roach sparked a 15-0 scoring run that allowed UT to more than double up the Buffaloes, at 29-13. The Texas defense had an impressive evening, holding CU to 18-of-55 (32.7 percent) shooting in the game, including a stingy 29.2 percent clip in the first half. Texas is now 9-3 all-time in five appearances in the NIT, and improved its record against Colorado to 15-10.